CARTHAGE, Tunisia (AFP) — Clad in a white linen tunic, sandals in the ancient Carthaginian style and a pendant and beads like those found with his remains, 2,500-year-old "Ariche" has virtually come back to life on the sacred hill of Byrsa where he was born. 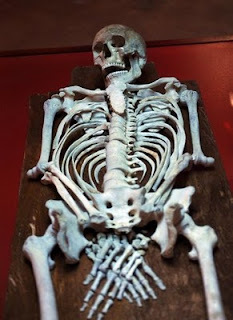 The outcome of scientific cooperation between France and Tunisia, the young man has been remodelled and returned to his native soil in historical Carthage, a city state that lasted from 814 B.C. to 146 B.C. He will be given a place of honour in the museum of modern-day Carthage, north of Tunis. "The distance that separates the centuries has been erased, the bones are given flesh and the eyes light up anew in a young man who lived right here six centuries before our own era," French ambassador Pierre Menat said at the opening of the exhibition last week. The modern history of the youth of Byrsa began in 1994 with the fortuitous discovery of a sepulchre on the southern flank of the hill, which is one of the most famous sites of antique Carthage. A joint Franco-Tunisian team moved in to excavate. "Gone too soon, taken prematurely from life and the love of those close to him (...) he was doubtless of noble birth and his body was buried in this generous African soil," said Leila Sebai, president of the International Council of Museums and commissioner of the exhibition. An anthropological study of the skeleton showed that the man died between the age of 19 and 24, had a pretty robust physique and was 1.7 metres (five feet six inches) tall, according to a description by Jean Paul Morel, director of the French archaeological team at Carthage Byrsa. The man from Byrsa has been rebaptised Ariche — meaning the desired man — at the initiative of Culture Minister Abderraouf Basti, who inaugurated the exhibition. Ariche has regained an almost living human appearance very close in physiognomy to a Carthaginian of the 6th century B.C. after a dermoplastic reconstruction undertaken in Paris by Elisabeth Daynes, a sculptor specialising in hyper-realistic reconstructions. "He comes back to us thanks to scientific rigour, notably that of paleo-anthropology and forensic medicine, but also the magic of art, that of Elisabeth Daynes, who knows how to bring many faces back from the distant past," Sebai said. Dermoplastic reconstruction is based on a scientific technique that enables experts to restore the features of an individual with 95 percent accuracy, though some aspects, such as the colour of the eyes and the hair remain partially subjective, she added. 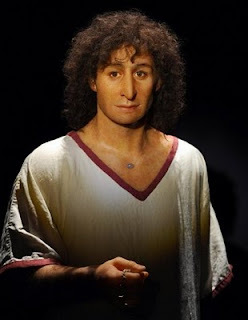 "We can clearly see that this exceptional witness to Carthage in the Punic era is a Mediterranean man, he has all the characteristics," noted Sihem Roudesli, a paleo-anthropologist at the Tunisian National Heritage Institute. "I hope that like his contemporaries, legendary sailors and bringers of civilisation, this young man can travel across the seas to bear witness on other continents to the greatness of Carthage," Menat said. Repatriated on September 24, Ariche will be on show at Byrsa until the end of March 2011 when he will travel to Lebanon, the land of the Phoenicians who founded Carthage, for an exhibition at the American University of Beirut.